The Bert & Phyllis Lamb Prize in Political Science is presented by Negotiation Guidance Associates in memory of Berton Lee Lamb and Phyllis Jeanne Schultz Lamb. Years ago, I enjoyed reading Herbert Spiro’s book entitled Politics as the Master Science. Spiro argued that the major, successful political institutions of our day are the result of the study of politics. One of the reasons I enjoyed Spiro’s book is because of the dinner table conversations in my home as I grew up. Our mother, Phyllis, especially engaged my sister and me in long conversations about successful policies and good governance. The interest in governance arose in the early part of our parents’ relationship and was one of the things they discussed throughout their lives. During our childhood, our father, Bert, focused on building his business. Our mother was also entrepreneurial, for a time owning an asphalt paving business. But at the same time they were absorbed in community affairs, such as whether or not to incorporate our small town. Both our parents were active in civic organizations. Phyllis’ 1940 drawing. A gift to Bert during their courtship. 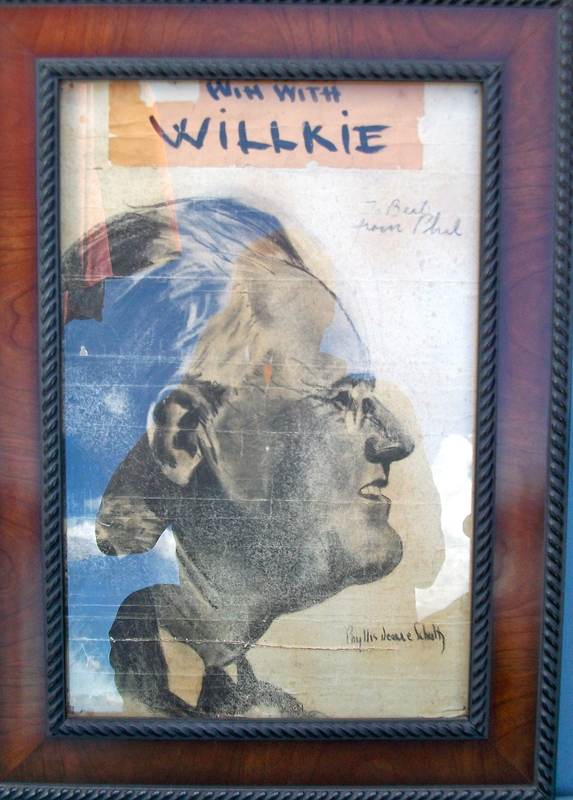 She favored Willkie. I can now recognize in our parents that they were of the generation that Almond and Verba described in their work The Civic Culture. Our parents had a strong belief in the political institutions of the United States. They were proud of our national heritage, appreciated America’s natural wonders, and encouraged a conservation ethic. But their main pride-of-country was in its executive, legislative, and judicial institutions. Our mother was one of those who in the 1950s and 1960s was frequently called to jury duty. From this experience her respect for our courts deepened but she also developed a clear understanding of the shortcomings of juries, as well as the role of advocates and judges. She saw the rough edges of the system but still believed in the value of citizen participation to make these institutions work. Belief in good governance was a primary value in our home. Probably, those values are what led our father to run for the Board of Education of the Palm Springs Unified School District in 1959. Among the many challenges the Board faced during the time he was its President (1962) was a demand to remove some books from the high school library. It seems quaint now to reflect that one of the books under demand for censorship was The Dictionary of American Slang. I remember his coming home after one long session of the Board to relate the story of how a group of citizens had insisted that book and others were unAmerican and should be removed. He was pretty angry, reflecting that we had just fought two wars to retain our liberty and he could not now support censorship. He also said he had not read The Dictionary of American Slang and probably would not have liked it if he had. Twenty years later Bert joined the government again. This time as Superintendent of Parks and Golf Courses for the City of Palm Springs, CA. His more than a decade of service to the City of Palm Springs increased his appreciation for public servants, especially strong and competent administrators; what Frederickson referred to as “the spirit of public administration.” Bert ever-more valued public involvement, and increased his dedication to fairness and justice in responding to the public and working with employees. The City recognized his skills and helped him obtain the background necessary to become a leadership and management trainer for City employees. Our parents shared an adventurous spirit that prized creativity and innovation. They fully believed that a well-educated citizenry was the foundation upon which American political institutions rested.